Have you ever been to Dogpatch? Yield to your curiosity. Dogpatch is an upcoming neighbourhood that is begging to be checked out. Some of my favourite people are forward thinking enough to live in the lesser known San Francisco neighbourhood called Dogpatch, nestled at the bottom of Potrero Hill towards the Bay. Vinny of Chicken Scarpelli fame lives here, Jeanne of 615 Project is fashionable in these parts, Brian does Industrial Works here, including building the interior of Farmer Browns. My favourite charcuterie makers have their kitchen in Dogpatch and, last but not least, this very blog is created here, too. Dogpatch is home to myself and Fred. We are usually met with blank stares when we tell a San Franciscan that we live in Dogpatch. It's true that this largely Industrial area is not that well known. But there are several reasons why it deserves to be on the map: Brunch at Just For You which I love a little more every time I go there, appeals to a wider demographic than just the neighbours. Who hasn't spent a lazy Sunday afternoon at The Ramp with live music and gorgeous views of the water? Our lifesaver - Moshi Moshi comes through when we have no food in the house with their neighbourhood sushi or the 'Fred Special' - gyoza followed by pork chop salad. Dogpatch Saloon is a unique, must-try experience for listening to Sunday afternoon Jazz with an eclectic and entertaining audience. Not only that, every year Burning Man celebrate their Decompression Party with an incredible street fair. Don't miss it this year, in just over a week, on October 8th. Yield is the latest addition to the Dogpatch neigbourhood and we love it. It doesn't hurt that only a couple of blocks walk away we now have a friendly winebar sporting an interesting wine list, made up entirely of biodynamic, organic or sustainable wines. My personal favourite from the current menu is an unusual sparkling, sweet red Gamay from the Savoyard region of France. Scrumptious and far too easy to drink! We have not been shy about familiarizing ourselves with Yield, which is a plain but inviting space made up of two rooms. The first is lounge-like with low seating, comfy dark brown leather chairs and pale suedette ottomans. Long wooden beams, a little awkwardly set at knee level, once you are in a seated postion, serve as tables on which to rest your glasses or bottle. The other room, soon to be made over with the addition of a fire place, sports a couple of (sometimes wobbly) high tables and accompanying bar stools, great for groups of half a dozen people to get together and catch up over a drink and snack. Talking of snacks, although Yield is not a food destination, per se, bowls of nuts, olives, chocolate or cheese plates and salad have always been available as something to nibble on alongside the wines. Chris the very friendly manager, has just bought a little oven and added hot flatbreads to the menu on Thursdays through Saturdays which is good news. Although the four cheese topped with prosciutto sounds exactly what would be my immediate first choice, the vegan version with olives, tomatoes, basil and cashew nut cream is, to my surprise, even more delicious. Very tasty indeed. I am not quite sure how it evolved, but Fred and I are now on first name terms with manager Chris. I guess that's what becomes of becoming a regular at a neighbourhood spot. 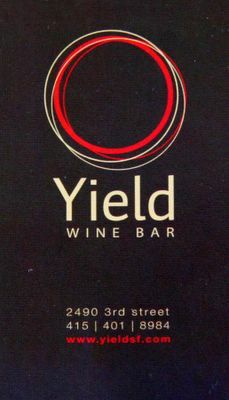 But even if you are not in the hood, Yield is worth a trip, especially if you are looking for a friendly, unpretentious, uncrowded place to unwind and gossip over a decent glass of wine in a relaxed atmosphere. Plenty of street parking is available, too, for the unenviable designated driver in your group. Maybe some of these good people will weigh in with their first impressions in the comments from a less-local point of view. PS - yesterday I went to the newly opened Westfield Center where I hoped to sample Tom Colicchio's San Francisco take on 'Wichcraft, but contrary to reports, it wasn't yet open. Intrepid (and newly infamous) reporter, the Bunrab, reports on where we ended up eating instead. PPS - Thanks to everyone who helped my mum out with ideas for her retirement party buffet a couple of weeks ago. You can read and see pictures of some of the food she rustled up, here. 2005 | Nook 1500 Hyde, San Francisco. We always wondered how long it would take for your delicious part of town to get discovered. This small wine bar is an oasis. The staff was so friendly and helpful And I love that everything is biodynamic. The white flatbread pizza was pretty good too. What I liked is that it's smart and sophisticated without holding and snotty snobby airs. PS: Cookie, I too remember the "dump". I never knew if it was my drinking excess or the construction but I always thought I was going to crash through the outside deck railing! So glad to read a thorough review of the Dogpatch. I was a partner in a bar there for a few years before we sold it and I have watched the neighborhood grow into something special. There are so many great restaurants around too. Cool post! I loved Yield. It was comfortable and the staff was so friendly. Loved the vegan flatbread, and the wine selection was great. I'll be back to Yield soon! the only downside of Dogpatch, which Fred and I experienced for the umpteenth time last night and which drives both of us, normally mellow people, insane is that cabs don't turn up. We waited 1.5 hours, totally missed a dinner reservation and ended up having to go somewhere local at 10pm. mum - when are you coming to visit? cookie - come back and visit again soon! jeanne - I am so happy you liked it and thank you for asking me about it. Ms Glaze - I have been wracking my brain to work out which bar you are talking about. It wasn't detox, no renamed retox was it? That is only about 50 footsteps from my front door. Jennifer - make sure you call me when you are in the hood!